Discovered PMTS 11 or 12 years ago, was mainly self taught until last year when I went to my first camp. Learned a lot about movement I had neglected (mainly CB) and came back this year for more. I have had boot fitting and alignment done by Diana and Walker, primarily, and while I'm not sure it is quite right, they think it is fairly close based on camp videos. I was fortunate enough to run into HeluvaSkier a couple of days after camp and he invited me to spend some time skiing with his group. Main thing I was working on, at that time, was, for lack of a better term, speeding up my transitions (I have a tendency to have a turn, short traverse, turn instead of actually linked turns) and increasing edge angles. Please ignore the first pole plant. Still fighting with old habits on them! Looking at video from that day, I see two things I am concerned about. First, with my turns to the left, I do not appear to be getting much high-C edge engagement and it almost looks like, at least from snow spray, that there is a little bit of a last minute edge set on those turns. Second, in transition, I seem to end up going into a slight A-frame. I can't really tell if this is something that is happening more on one side than the other, but I see it in all turns. Does the release start by flexing the outside leg? Does LTE tipping lead engagement to the new turn? Are the feet pulled back at transition? Is the inside foot held back throughout the turn? Is there enough CB and CA and is the timing right? Is the pelvis included in the CB/CA movement? Is the inside leg flexed as the turn progresses? Does the outside leg extend naturally (no pushing) as the turn progresses? Does LTE tipping continue throughout the turn? Is there a pole touch and how is the movement and timing? Alignment - watch the skis and knees carefully - does anything look like it needs to be tipped in or out? What I take from this is that I need to do more drills focusing on CB, especially on left hand turns, and really focus on getting pelvic movement involved in that CB. That is similar to feedback I have gotten in camps (with the addition of trying to actually link turns, not do turns with short traverses), so in some ways I suppose this video is a bit more of an "in the way of introduction". However, I would welcome comments anyone else may have on this. The main areas I am concerned about are the asymmetry in my turns and the slight A frame I am seeing in my transitions, although any other MA advice. If you have any desire for a higher resolution video, I can try to find somewhere to post it. I was a little disappointed with YouTube's transcoding of this. It looks much better in Coach's Eye! What was your SMIM for the last day of camp? I just want to comment that I like your skiing ErikCO. I won't speculate what the cause is, but the obvious thing I see is lack of CB on your right-leg turns. Thanks noobSkier. Looking back at videos from camp, I had better CB on turns in them, so I think I went a little backwards there on this day. Max, last day of camp was a little chaotic (people worrying about an incoming storm, instruction split between the instructor and Harold) so I hope I have this correct. SIMM, though that term wasn't really used, was transfer to LTE when I think I'm ~80% through my turn (i.e. sooner) and start immediately tipping free foot to LTE. What this was attempting to combat was me transferring to LTE when the skis were essentially facing across the hill, fighting to stay balanced on LTE for a short period of time, which always ended up turning into a long period of time, then tipping after I had traversed a short distance. Which camp did you attend? As you pointed out the left turns are not as strong as the right. I'd suggest more work on CA/CB with a focus on getting the pelvis moving correctly. Here's an old post that might help. In PMTS the "upper body" includes the pelvis as part of that unit. h.harb wrote: I've probably said this 1000 times, if I've said it once. There are many ways to achieve the combination of hip, pelvis, torso and upper body tilt to CB, as there are ways to tip your skis. 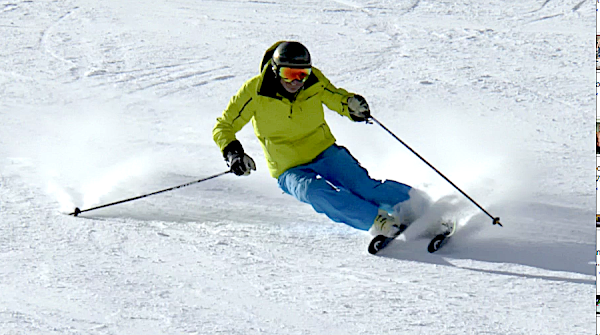 Some people don't feel their feet yet in skiing, so you have to tell them to move their knees to the side. Some don't know which way to tilt or rotate for CB or CA, so you begin with the hands and the arms, so they can at least have some idea of what they are trying to accomplish. If I could tell everyone to lift the inside hip using the combination of muscles needed and it would work, great I'd do it all the time, and do only it. But in the real world that is not how it works, everyone is different and everyone is at different levels and abilities of movement. In our camps we offer as many different approaches as we need for people to gets their movements to go in the right direction. The deeper you get into understanding your own body the more success you will have with skiing movements. The upper body, hip, pelvis and arms, should move together. 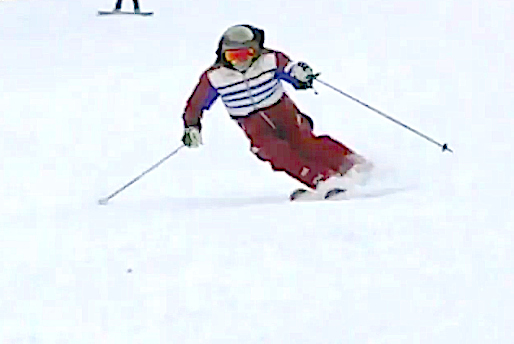 If you are trying only with your pelvis up or down, you are going to be a long time coming before your skiing is right. We have many skiers who are "opposite" to correct, pelvis movers. They lift the wrong side, in the turn. We know that telling and showing them to lift the inside pelvis, to correct the pelvis has limited success, so you begin with the arms then the shoulders, work your way to the pelvis, (pelvis movements are what people are least aware of), to finally adjust the level. Probably the best way to get down to the pelvis correction quickly, is to work it out for yourself when you are off your skis. Do the wall leans or sits, as described in my books and web site. 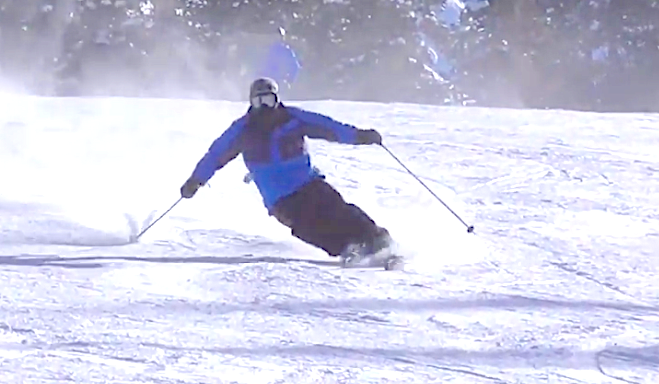 Then you have to keep practicing the movement while skiing. I know skiers can often set the pelvis perfectly, time after time, while standing still on the snow, but as soon as they start moving it goes the wrong way. I often hold their pelvis in the right place to convey the right situation. It's a battle with yourself, your own body, but the answer is, build the whole torso, shoulders and arms included, to get down to the correct angles for the pelvis. And for Pete's sake, correct yourself as you come to a stop for your last turn. This is often the most frustrating to watch, skiers are working on a specific movement while connecting turns, but when they come into the last turn of a series, and come to a stop, they just let go or quit. That is your most important turn, don't give up on the last turn, that's where you can check yourself to see if you have done it right. Regarding Counter Acting (CA) - we only need as much CA as required to keep the upper body from rotating to the inside of the turn but when practicing try to exaggerate. When MAing your own video look for the belly button pointing towards or past the tip of the outside ski as confirmation that you are getting some CA at the pelvis/hips. And remember, CA is a movement not a static position. Stand in front of a full length mirror in tights so you can see your pelvis movement. 2 - turn your feet/legs so they are 45 degrees to the right. This is a left footer (right turn). Now practice CA by rotating the pelvis to the left (the upper body will move too because its connected to the pelvis). 4 - when you can do it with flat feet add tipping. 5 - when you can do 45 degrees turn the feet/legs a bit more to increase your range of motion. Note - don't let the hip get into goofy positions, keep the rotation around the head of the femur of the stance leg. There is more information on the role of the pelvis in pages 93-95 of Book 2. HH wrote, "... when practicing try to exaggerate...."
Erik, do you have a slope easy enough so you can exaggerate the correct movements? So you can concentrate on the movements without being concerned with your speed or much traffic? Find the slope where you can really get to know the correct movements. Drill, drill, drill. Repeat, repeat, repeat. You eventually want your body to make the correct movements without you thinking about them, and that takes repetition. Gradually increase the slope so you know when you nailed the good movements or slipped back into the old ways. When you make an incorrect movement, know it, and make the correct movements even if it means going to an easier slope. Really try to avoid repeating incorrect movements. This takes time, but it's worth it! None of us are perfectly symmetrical. If it takes more effort, more repetition for you get one side correct...you're part of a big club. If you isolate and select different parts from every turn in the run, you did every part of a turn correctly at some point. So the answer is consistency. You have all the movements. However, all the movements aren't in every turn. Yes, could CB be better of course? Could CA be better sure? The timing for your release could be coordinated better with the lower C part of the turn. This means flexing out of an arc while the ski is loaded or pressured. Every so often the entry to the left turn is delayed, with a slight extension on the right leg, before the edge change. As someone quoted, "arms and torso are one unit". In this comparo, include your upper back and torso with a stronger inside shoulder and pole turn toward the outside ski boot. Also, prepare the outside pole to help with counteracting. These are the same things I worked with Reilly on over the last 4 seasons. If you look at his earlier skiing compared to now, you can really see the changes are not subtle in Reilly's skiing. This might help everyone? Thanks for the comments and analysis! And a happy new year to all of you! Max: I'm working on getting some full body mirrors up on my wall so I can do a better job of evaluating dry-land exercises. I do some dryland (and I think the exercise you provided is a good one. I've done some like that but hadn't thought of turning feet at an angle to a mirror so I would end up looking at myself straight on.) Glad you don't see a lot beyond what I was all ready thinking as areas for me to focus. Ken: The run I was on is actually one that can work for that, and is the one we used in camp the week prior to this video. I was purposefully attempting for "more of everything" (CA/CB/tipping/etc) following a week of practice at camp to see what had changed and what my weakest movements are, but even on that slope I can slow things down, drop speed, and focus on individual movements. Unfortunately, finding someone who is good at video, wants to ski the same way I do, and is available when I am is a tough combination. And I should be getting back to a large mountain next week so I can get some long easy greens to practice and drill on. 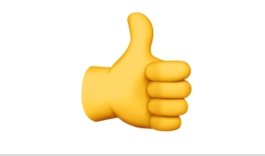 Harold: Thanks SO much for your comments. Even if I didn't get all the movements at the right time in the same turn, it is really good to know that all the movements are present. Now just need get them all happening in the same turn, at the correct time in the correct amount! Should be easy, right? Also, thanks for pointing that out about my left turns. Looking at the pictures of you and me side by side does really show the difference. I am resisting and building pressure instead of flexing to start releasing (correct me if I am wrong there). That might explain some of why I was feeling/seeing that I wasn't flexed enough in a number of my releases going into my left turn. I do need to do some work on pole use, too. I have mostly tried to just keep my hands and poles from doing anything detrimental for the last year, except when I venture into bumps, as I have a tendency to do a big-swing pole plant, not a no-swing plant, if I'm not careful. Probably something to talk with a coach about at the next camp I do. Nice skiing Erik; keep up the good work. For those watching, this clip doesn't capture how strong of a skier Erik really is. He had a few runs the day we skied at A-Basin that I wish we had caught on video... he was really ripping. I agree with Greg, I saw the guys skiing, Erik was showing some really strong skiing. h.harb wrote: The timing for your release could be coordinated better with the lower C part of the turn. This means flexing out of an arc while the ski is loaded or pressured. Every so often the entry to the left turn is delayed, with a slight extension on the right leg, before the edge change. ErikCO wrote: I am resisting and building pressure instead of flexing to start releasing (correct me if I am wrong there). You should release while stance ski still loaded/pressured and bent. See Essentils of Skiing, p.162, A Less-Energetic Release Requires More Work To Balance. I guess I could have used this to compare, it's helpful I believe to see the body angles in different turns reacting to the shape of the arc you want and snow surface.